This makes such a quick healthy supper & is perfect to eat at any time of year. 2 red bell peppers (5 to 6 ounces each) halved widthwise, seeds & ribs removed. Start by cooking the rice & frying the chopped mushrooms along with the pine nuts in a tablespoon of coconut oil. Then cut the goats cheese into chunks along with the apricots & medjool dates. I personally prefer to mix my apricots & dates with my cooked rice. 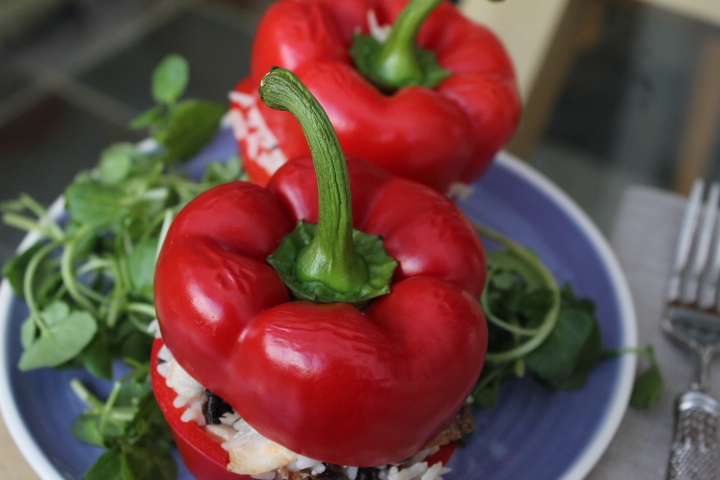 Place in your pepper a tablespoon of rice & then cheese or brewers yeast, then mushrooms. Continue to layer the ingredients until your peppers are completely stuffed. Place your stuffed peppers in the oven to cook for 10 minutes on 170 Degrees Celsius. Once cooked garnish with salad or steamed assortment of seasonal vegetables & enjoy. Bell peppers are an excellent source of carotenoids & vitamin C.
They will also benefit you because they contain vitamin B6, B3, B2, K,A, & folate, They are also a good source of dietary fiber & potassium, along with manganese, phosphorus & magnesium. Additionally they are a low calorie & low GI food as well as providing a broad range of antioxidants. Brown rice is the least damaged in its nutritional value because only the outermost layer of the hull is removed. It benefits you because it contains manganese, selenium, phorsphorus, magnesium, copper, vitamin B3, & fiber. Additionally it is a low calorie & low GI food. Research has also confirmed that the oil in whole brown rice can lower cholesterol & diabetes type two. Mushrooms are now considered to be a new super food & it is believed they have powerful healing properties. White mushrooms are a good source of fiber, selenium, riboflavin, B2, potassium, copper, thiamin, B1, niacin & folate. They make a fantastic substitute for meat but still contain iron & have no cholesterol, fat or gluten & taste delicious. Pine nuts are a good source of nutrients, vitamins, essential minerals & the good monounsaturated fatty acids that help in reducing cholesterol levels in blood. I used a high quality goat’s cheese because it works well if you have a sensitivity to lactose in cow’s milk. It is easier to digest as it’s formed with shorter amino acid protein chains. Goat’s cheese has fewer calories to regular cheddar cheese, & less sodium. Additionally it contains more vitamin K, D, niacin & thiamine. It is also a good source of phosphorus & riboflavin. If you are a strict vegan then Brewer’s yeast makes a great alternative to goat’s cheese in this dish. Especially as it’s fortified with vitamin B12, which is the vitamin that vegans are at risk of having low levels in. It is also rich in chromium among other nutrients, which is beneficial in balancing blood-glucose levels & good in managing type 2 diabetes. It is a good source of selenium, which is a mineral with essential antioxidant benefits as well as a host of B-complex vitamins which are important to provide energy, & support the nervous system, promote good digestion, & support the quality of your hair, eyes, skin & liver function. Please note avoid brewers yeast if you are pregnant, breast feeding, children, suffering with atopic dermatitis or those with impaired immunity, crohn’s disease, ulcerative colitis or gout because of its high purine content.